The Triumph Bonneville is a classic bike, if ever there was one! One of the most celebrated motorcycles ever built, its very name is liable to induce weak knees in its devotees. The 'Bonnie' invokes visions of a time when the material world was made out of metal - plastic a brittle blip on the horizon. Now, the future of the planet comes before that of classic motorcycles ... but the petrols and oils of yesteryear had a 'spirit', which today's sanitised synthetics lack. Such products are part and parcel of the design icon that is the Triumph Bonneville. It is ironic that a bike that so epitomises Sixties Britain should reference the USA in its name ... to wit, Utah's Bonneville salt flats. Back in '56, Johnny Allen had climbed aboard a Triumph Streamliner, and propelled it to 214mph. The Bonneville roadster was good for roughly half that. Still, 110mph was more than enough for most 'rockers' and 'ton-up boys'. That left 10mph margin ... in case of headwinds! For Bonnie aficionados, the bike would become virtually a part of their anatomy! 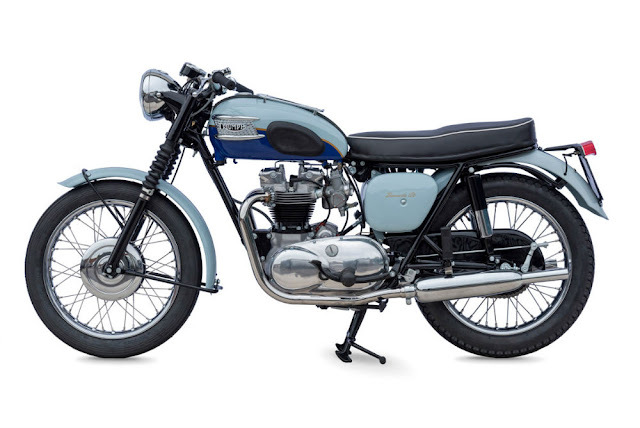 In Triumph's glory days, the Bonneville was the beacon for the brand. Some quarter of a million Bonnies passed through the firm's Meriden factory gates. On the Isle of Man, a Bonneville won the Production TT, in 1967. Two seasons later, it was a Bonneville which recorded the first 'proddy racer' 100mph lap of the 'island'. How the ton-up boys must have rejoiced! Even on less celebrated roads, the Bonneville was a legend in its own landscape! So, when the rockers decamped to the seaside, on that historic day - to do battle with the mods - it is a safe bet there was many a 'Bonnie' seen blasting down to Brighton beach!